This is our Pig Nose #2. Like most of our pieces, this prosthetic appliance was made to fit most faces. The main picture above is the hot foam latex version applied and painted in beige. 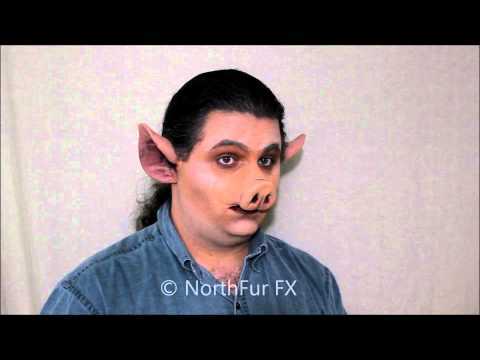 This nose is similar to the first Pig Nose, however it covers less of the face. It was made specifically for the independent film "The Brick House". It has has a pig shape and wrinkles across the nose's bridge. Paint it in browns, flesh tones or pink for many pig breeds and styles. It is one piece and comes unpainted by default. Teeth, contact lenses, ears and other prosthetic pieces other than the Pig Nose #2 that are shown are not included. Using these types of costume accessories can help accentuate this prosthetic piece's piggish features.